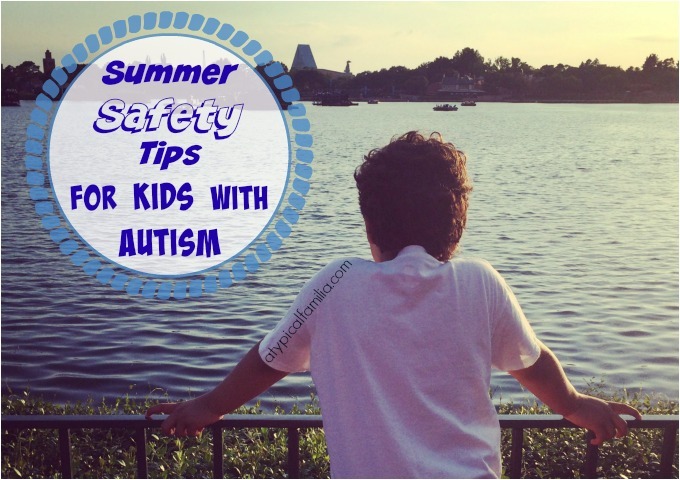 Autism safety is always top of mind especially during the summer. Over the next two months, families will take excursions to the beach, park and amusement attractions. They’ll go off on week long vacations or quick weekend getaways. However traveling and venturing out with special needs kids can be stressful, especially when the destination is unfamiliar and crowded. The summer Norrin was first diagnosed we didn’t go out much and when we did, we didn’t go far. But each summer since, we’ve gotten more adventurous. We don’t want to feel confined to four walls and familiar places because we’re scared. We also take a few simple precautions before and after walking out the door. Take a photo before you head out the door. Whenever we travel or visit a major attraction, we take a photo of Norrin before leaving the house or hotel. Since most phones have cameras, this is such a simple thing to do as a safety measure. During a moment of panic, recalling what your child is wearing may difficult. Having a photo will ensure your accuracy and officials will have the most current photo of your child. Know the lay of the land. If you’re going someplace new, print out a map and familiarize yourself with your destination. Look for the bathrooms, guest services and possible exits. Know where the “Lost Parents” office is located. These days, amusement parks have apps. Create a game plan for the day and designate a meeting spot in case your group becomes separated. When you go to a playground or museum – look around for the exits and blind spots. Personally I prefer playground with only one exit/entrance. Prepare Your Child (as much as possible). I know this is easier said than done. But still make the effort. We talk a lot about safety and things that are dangerous. We talk about police officers and where to go if he needs help. Norrin has speech but in case of an emergency, I don’t know if he’ll know who to ask or where to go. This is something we still work on every time we walk out the door. I hope the information sinks in but I also hope he’s never in a situation where he has to use it. Twigtale offers a few titles to help your child understand the importance of safety. They also have a cool app! What’s especially great is that all Twigtale books can be personalized. Kid in Story is also a great app to make your own safety social story. Child Identification/Contact Information. Norrin knows his first and last name, our names, where he lives and our telephone numbers. But again, he may not provide the information if asked. When we go out for day trips or vacations, we put on Norrin’s ID – nothing fancy, just a dog tag chain necklace with our information. He’s used to it now, so he keeps it on. There are also MedicAlert Bracelets and Tattoos With A Purpose. Also – you may want to look into a GPS tracking device for your child: like AngelSense* or FOLR. Communicate with your group. My group usually consists of me, my husband, Joseph, and Norrin. Norrin isn’t the kind of kid that can walk ahead or trail behind us. (I only let go when I feel absolutely comfortable in my environment and even then, I am close by.) At 9-years-old, his hand still needs to be held most of the time – especially in really crowded places. If I have to let go of Norrin’s hand for any reason, I always tell Joseph. And I don’t let go, until Joseph takes Norrin’s hand. When out with Norrin, we always work as a team to keep him safe. * I am a AngelSense affiliate and my affiliate link is included in this post.